[map] [street view] South of I-10 exit 53, south of Patterson Road. Co-located with WPMI-DT, WSRE-DT, WDPM-DT and WMPV-DT; FM stations WXBM, WMEZ and WTKX. AUX: 8.5 kW @ 1407 feet. 60 dBu protected contour map, from the FCC. [Picture] a promotional button from the WOW 107 days asking everyone to "Be Sweet!" [Picture] Image showing the RDS text data on a Sony Bluetooth portable headset's display, showing the Radio Text. 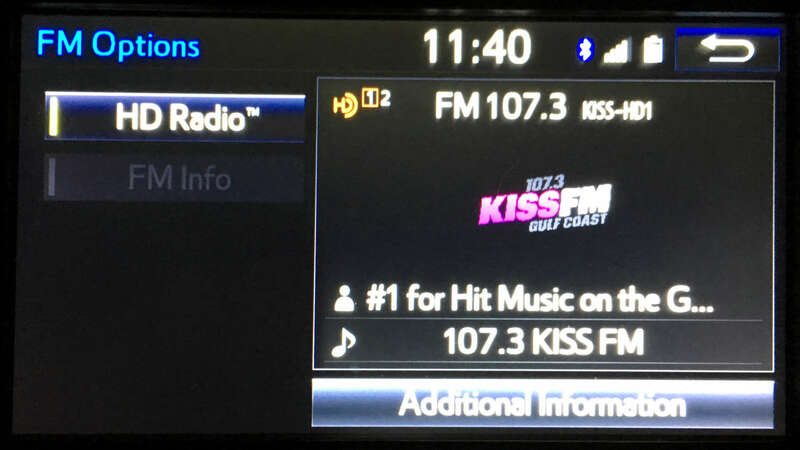 [Picture] Image showing the RDS text from a Mazda sedan's radio, showing the PS (station name), Radio Text and PTY (format) fields. [Picture] Screenshot from SDR-Console V3 software showing the RDS PS, Time, Text and PTY for this station, as well as a spectrum waterfall showing the analog signal and the two HD sidebands on either side. (Note that the PTY description code on this software corresponds to the European format, not the North American one.) From the Kiss FM days. 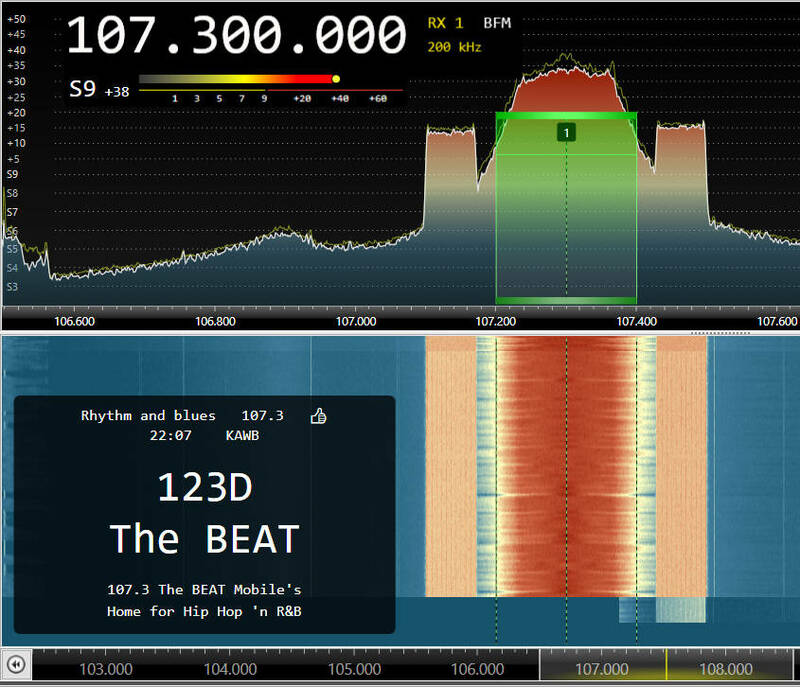 [Picture] Screenshot from SDR-Console V3 software showing the RDS PS, Time, Text and PTY for this station, as well as a spectrum waterfall showing the analog signal and the two HD sidebands on either side, right after flipping to urban contemporary as "107.3 The Beat". [Picture] Image showing the HD PAD from a Mazda car stereo for the station's HD-1 broadcast from the "107.3 The Beat" era, December 2017. 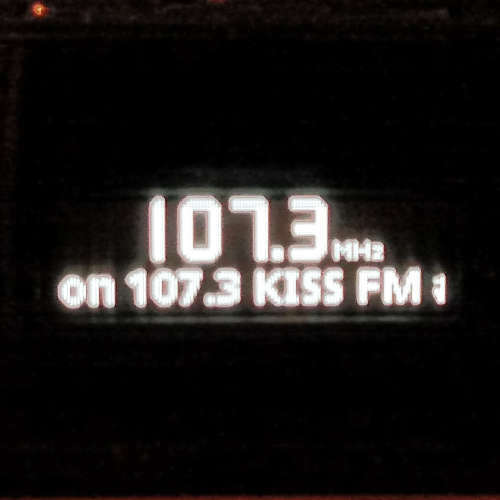 [Picture] Image showing the HD PAD on an Insignia HD portable radio's display for the station's HD-1 broadcast from the "107.3 KISS FM" days. 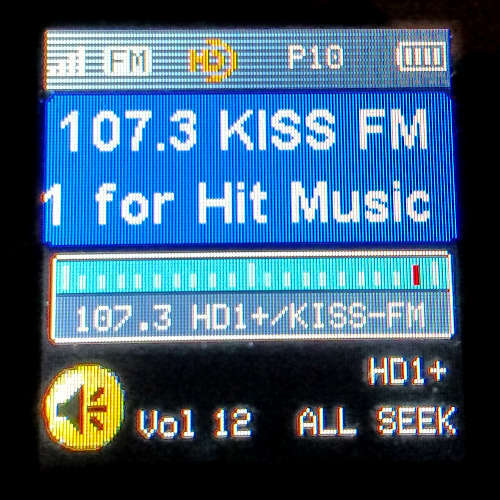 [Picture] Image showing the display from a Toyota radio with HD Artist Experience including the station logo for the HD-1 broadcast from the "107.3 KISS FM" days. 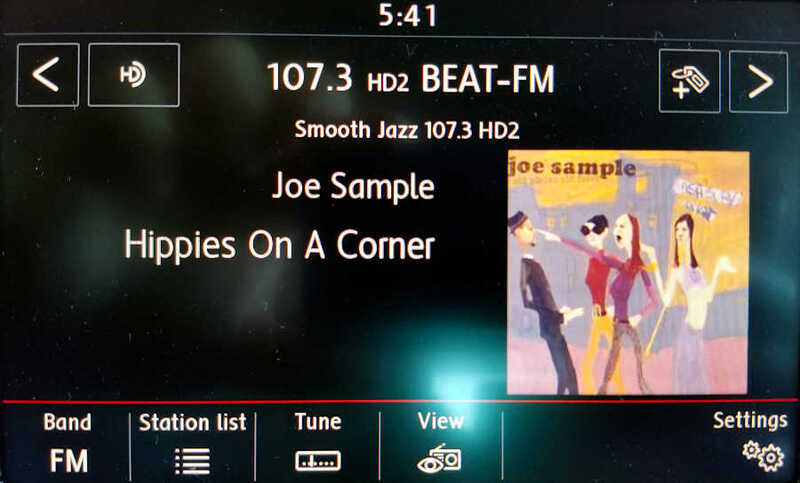 [Picture] Image showing the display from a Toyota radio with HD Artist Experience including the station logo for the HD-1 broadcast from the current "Beat" format, from May 2018. 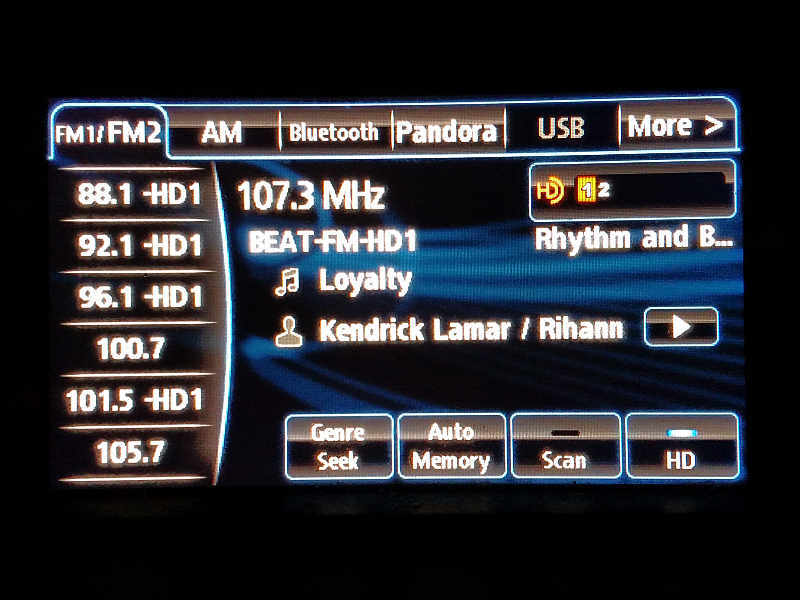 [Picture] Image showing the display from a Volkswagen radio with HD Artist Experience including the station logo for the HD-2 broadcast, from April 2019. During the consolidation craze of the mid-90's, the station went through several rapid changes in ownership, from Colonial to Paxon to eventually Clear Channel, who today is known as iHeart Media. In October 1996 calls changed to WYCL; around that time they flipped to rock and spent a brief period of time as "New Rock One Zero Seven". Later it went to oldies as Kool 107 when it was acquired by the same owners as another rock outlet, WTKX. In late 2004 the oldies format was tweaked to more 70's and 80's AC, with the slogan "My 107.3". The station got a permit to relocate to a taller tower in Baldwin County — just west of the Alabama border on the WJTC-TV tower near Elsanor — to further expand coverage towards Mobile. The station had to drop to 50 kW to make the move, which went online in 2008. Around the 25th of February 2010 on-air announcements began, encouraging listeners to tune in to Mobile-based sister station Lite 99.9 WMXC. The station also briefly simulcast WMXC. On the 26th, the station flipped to rhythmic AC as "The Groove". The calls changed to WRGV (We'Re GrooVin'?) in March 2010. A mid-April 2010 press release from the Mobile BayBears minor league baseball team mentioned that all their games would be available on WGRV's HD-2 channel, calling it ESPN Radio. This is the first mention of an HD subchannel for the station, and at the time it wasn't known if this was an already active subchannel or a planned expansion in time for the baseball season. In September 2010 the entire HD feed was reported to be off. The HD feed showed back up shortly thereafter, but with no subchannels. In mid-November the HD-2 channel reappeared with a raw ESPN feed with no local commercials. Sports eventually gave way to the generic Premiere Choice content feed of Smooth Jazz, same as on WMXC-HD2, in the fall of 2012. In late April 2010 the station began to segue away from rhythmic adult contemporary towards a more top 40 hit (CHR) sound. The slogan remained the same but the music was going head to head with i100, WABB and BLX. When i100 dropped out of the CHR race to play 80s/90s music, the station took the opportunity to tweak the slogan to "107-3 Hit Music NOW" to better reflect the format while still keeping some urban leaning flair. After WABB announced it was being sold to religious broadcasters in mid February 2012, WRGV almost immediately tweaked its playlist again to be more straight-ahead CHR. A few months after the demise of the legendary WABB, it was brought back to life, sort of, by Cumulus who swapped the station for another Mobile property and brought CHR back to 97.5 as WABD. 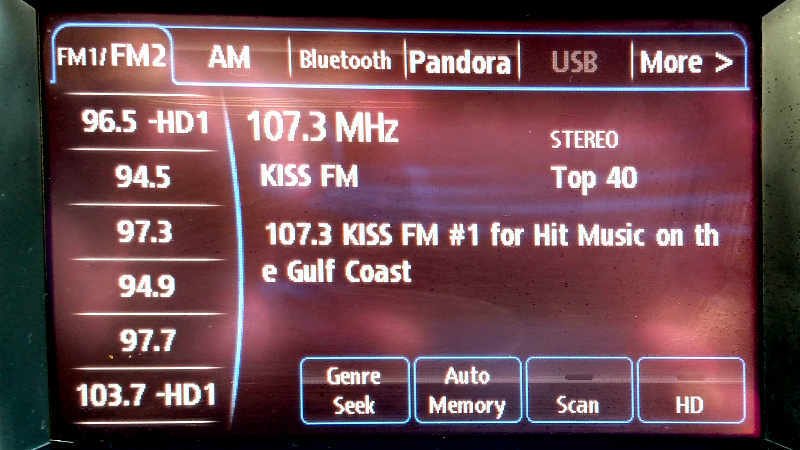 In mid-July 2015 the station re-branded to "107-3 Kiss FM Gulf Coast", but with no changes to air staff or show programming. 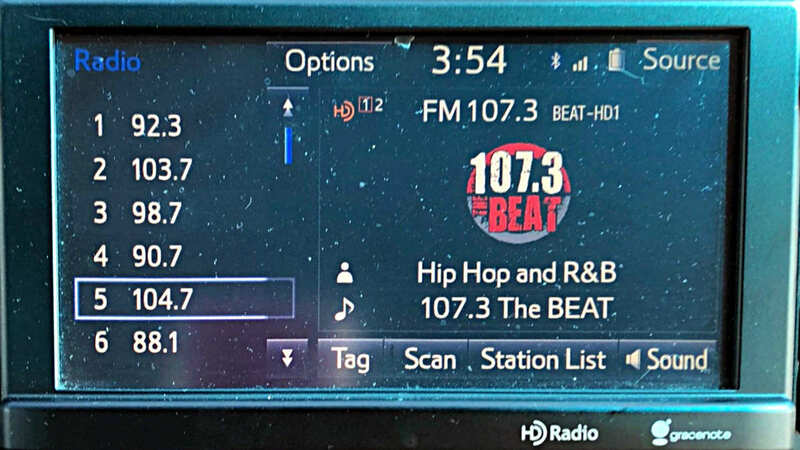 On 8 December 2017, the station flipped from the CHR format to Urban Contemporary as "107.3 The Beat", assuming the programming and slogan of Mobile's "100.3 The Beat", a translator/HD-2 combo.